This was my dinner tonight, and it was amazing. The other times I’ve made this dish, I just steamed the asparagus, which was tasty, but caramelizing them in butter just made the whole dish phenomenal. When you cut into the eggs, the yolks blend with the Parmesan and brown butter to form a wonderful sauce that complements the nutty roasted asparagus perfectly. The cooking method for the asparagus is based on Lidia Bastianich. All in all, this is a classic combination, and a favorite light meal. We’ll be eating this as long as asparagus is available. Snap the woody ends off the asparagus and peel the bottom few inches of the stems. Melt the butter in a skillet on medium heat, and add the asparagus, turning a few times to coat in butter. If appearance matters to you, put in all the spears the same direction, which will make removing them that way easier. Sprinkle with kosher salt, cover, and allow to steam for 4 minutes (longer if your asparagus is especially thick); remove lid and turn asparagus over—they should be nicely caramelized on one side. Turn the heat down to medium low, grind a bit of fresh pepper over the spears, and allow to cook for an additional 4 minutes, or until very tender and caramelized on the other side. Meanwhile, poach the eggs in barely simmering water with a splash of vinegar (it helps the proteins in the eggs to congeal more quickly). 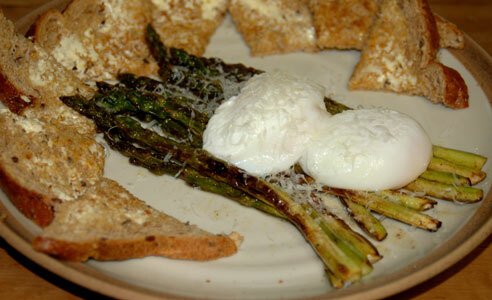 When the asparagus and eggs are both ready, arrange the asparagus like a raft on your plates. Scoop the eggs out with a slotted spoon and drain very gently. If the vinegar taste bothers you, drop the eggs into a bowl of hot water for a moment to rinse, then drain. Top asparagus with eggs, and add a pinch of fleur de sel and a shower of freshly grated Parmesan. Serves 4 for a light breakfast or lunch, or 2 for a more substantial dinner (preferably with thick slices of whole grain toast to sop up the yolks). Update 4/30/07: Dinner was pan roasted asparagus with poached eggs, Grana and balsamic reduction, and Touch-of-Grace biscuits. It was lovely and very tasty, as always. The balsamic was perhaps a bit over the top, but we had it from the previous night, so I decided, what the heck. Jeremy commented that this was quite a decadent, rich meal, which is funny because it really isn’t all that fancy, and could hardly be easier to make.